In order to ensure direct “policy-driven” benefits for Scheduled Castes (SCs) through specific interventions, the Planning Commission during the 1970s introduced plan strategies known as Special Component Plan (SCP). The main objective of SCP was to channelize plan funds for the development of SCs in accordance with the proportion of SC population. The strategy of Scheduled Caste Sub Plan (SCSP), earlier known as Special Component Plan for Scheduled Castes, is in force since 1979-80 and it is meant to ensure proportionate flow of plan resources for the development of SCs. For the implementation of SCP, Gujarat has created administrative machinery. The Social Justice and Empowerment Department is the nodal department in charge of the Scheduled Castes Sub Plan. While the SCSP schemes are to be prepared and implemented by the respective departments as a part of their Five Year and Annual Plan schemes, the Social Justice and Empowerment Department is required to oversee both the formulation and implementation of the Scheduled Castes Sub Plan. In order to ensure proper implementation of the Special Component Plan Schemes, starting with 1983-84, the budgetary provisions under the various schemes of the Special Component Plan was consolidated under a separate and single demand No 95 of the Social Justice and Empowerment Department. This was been done to ensure proper and full utilization of the outlays provided. Ironically, neither there was proper fund flow nor full utilization of even less allocated funds in last 40 years. The major objectives of SCP’s implementation are to ensure minimum desirable levels of income and to provide the basic minimum needs to the SC population in the villages. The SCs, who constitute about 7% of the state population, are at various stages of socio-economic progress and face number of problems on account of social exclusion. SCSP was evolved with a view to expedite socio-economic development of the SCs. Actually, schemes and programmes should have been formulated by the Department of Social Justice and Empowerment, rather than each department; this is the one of the reasons for the poor implementation of SCSP. In present, when there is no clear guideline for the implementation of a strategic sub plan like SCSP, It is more important to focus upon “Budget Justice” for the SCs – this is crucial as they face various forms of discrimination and deprivation, they are poor and are heavily dependent on the public provisioning of essential services like food, education, health care, social welfare and social security, protection and care. They have not benefited equally from public policies and public spending due to gaps in policies and poor implementation of government interventions as well. One possible remedy could be to formulate the act for implementing SCSP for ensuring the proportionate financial outlay, ensuring more of direct benefits and preventing notional expenditure with community monitoring for ensuring the transparency and accountability measures. One of the guiding principles for strategic plan for the welfare and development of SCs for formulation of SCSP was to earmark the financial outlay in proportionate to the SC population from the state’s plan outlay. The budgetary data of the state’s plan outlay and budgetary outlay and expenditure for SCSP reveals that the state never ever made 7% of budget outlay and expenditure for SCSP in the last 38 years. The expenditure under SCSP was never fully utilized except during the Eighth Five Year Plan, when the expenditure registered 111.67% against the budget outlay of Rs 341 crore; in value terms, the expenditure under SCSP reached Rs 381 crore. In the remaining 33 years, there was huge under-spending of budget outlay under SCSP. The actual expenditure has been in range of 68% to 89.79% except during the Eighth Five year plan. SC communities in Gujarat have suffered historic injustice on caste basis; their economic and social status is lower than others. At around 7% of the total, the SC population in Gujarat is 40.74 lakh out of state’s population of 6.04 crore. SCs in Gujarat are dispersed in all the districts of the State; the bulk of SCs, however, live in eight districts. There are 2,361 villages and towns which have SC population of more than 250 people. A larger concentration of SC population could be found in Ahmedabad, Banaskantha, Junagadh, Mehsana and Vadodara districts. Very few SC people hold agricultural lands. There are about 48.85 lakh operational holders operating about 98.98 lakh ha land as per the Agricultural Census 2010-11. SC people are land holders of only 1.62 lakh (3.32%) and operate 2.94 lakh hectares (2.97%) area of operational holdings. Landlessness among SCs is very high. 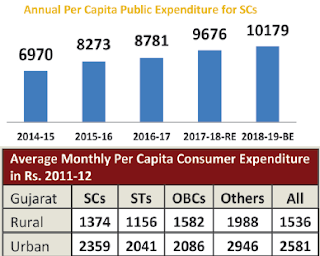 Monthly per capita consumer expenditure of SCs in Gujarat is Rs 1,374 in rural and Rs 2359 in urban areas, which is less than the state average. SC landless households deriving major part of their income in rural areas by manual casual labour are 63.24%. In rural areas only 4.68% households have salaried jobs in government; 77% households in rural areas earn less than Rs 5,000 per month. Literacy rate among SCs is 70.5%, higher than the state average (69.14%), but the transition rate from the elementary to secondary is 87.32% and secondary to higher secondary is just 55%, which is far below general category (71%). Malnutrition among SC children is also high. Around 42.3% SCs children (0-.59 months) were found stunted, According to RSOC (2013-14), severely stunted children are to the tune of 19%. Wasting was found among 21.7% children, while 7.5% were severely wasted. 39.4% SC children were found underweight. 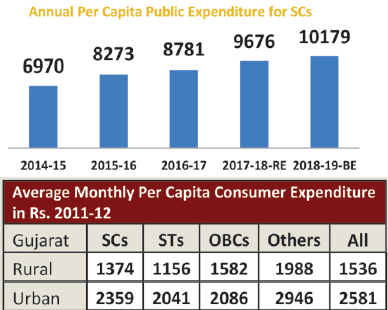 The average monthly consumer expenditure for SCs is Rs 1,374 and Rs 2,359 in rural and urban areas respectively, which is less than state average of all social groups. 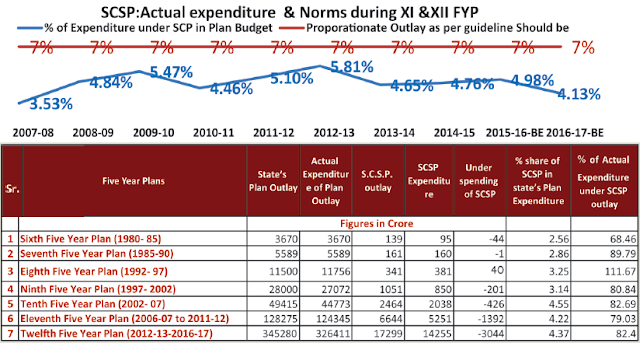 The under-spending of budget under SCSP has always been very huge across all years. 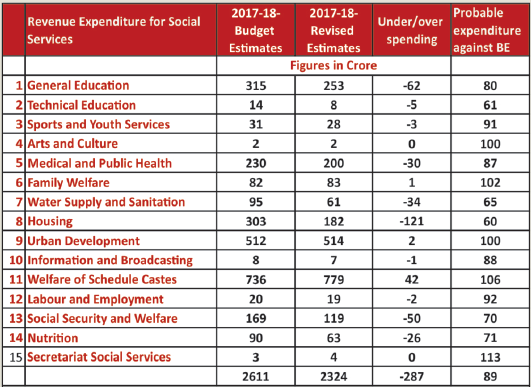 In the year 2017-18, the under spending for social services on revenue account was Rs 287 crore. Under-spending for most critical development sectors like education, medical and public health, water and sanitation, housing and nutrition is very huge. The spending of Rs 512 crore, the highest amount for urban development, is notional expenditure”, which provides services to all community members instead of just the SCs. 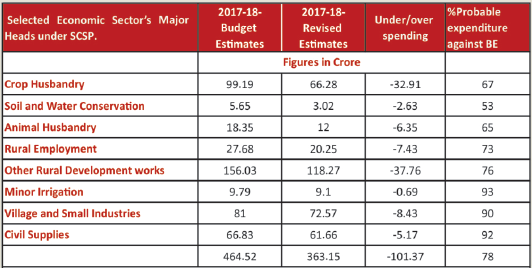 The revenue expenditure for economic development in 2017-18 among selected major heads was also less than what the budget earmarked. Under-expenditure for crop husbandry was estimated to be Rs 33 crore, animal husbandry Rs 6.35 crore, and Other Rural Development Works Rs 37.76 crore, Village and Small Industries Rs 8.43 crore, and civil supplies Rs 5.17 crore. Under spending is estimated to be Rs 101.37 crore for revenue account.The overall utilization was to be 78%. The analysis of SCSP for the last 40 years reveals that the budgetary outlay and expenditure have never been in proportionate to the SC population in Gujarat and under-spending is huge. For the development and welfare of SCs, SCSP should be converted into legislation to ensure Budget Justice to SCs with provisions like non-diversion of budget outlay under each Major Head (Functional Head), even as ensuring maximum direct benefits to SCs with minimum notional expenditure, and periodic upward revision of unit cost of each welfare scheme. *Director, Pathey Budget Centre, Ahmedabad.